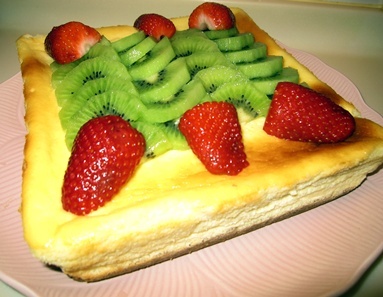 It has been a long while since I last made a cheesecake and to coincide with Hubby’s home-coming from a business trip, I tried out this recipe. I had previously made a non-bake version so this time, I wanted to try one that requires some baking time in the oven. That first time, I made the cheesecake by hand-mixing as I had not gotten an electric mixer at that time. Perhaps I did not mix it sufficiently then as the cheesecake turned out slightly heavy. This time, the mixing process was a breeze with my electric mixer. Oh, the joys of modern appliances! However, lest I got too trigger-happy, I was warned not to over-mix for cheesecakes. Too much air added to the mixture can lead to deep cracks in the top of the finished cake as the air bubbles expand during baking. Another reason for cracks, I learned, is a sudden and rapid change in temperature if the cake is baked at too high a heat or when the cake is cooled too quickly. Even with this bit of information in mind, I think I must have over-mixed. Towards the end of the baking period, a small crack started to develop across one section of the cake top and when the cake was done, a deep crack was deeply etched on the cake’s surface. Thankfully though, with the help of some artfully-positioned fruits, it still looked presentable enough for tonight’s dessert. 1. Pre-heat oven to 160oC. 2. Line base of a 20-cm diameter baking pan with baking paper. 3. Melt butter in a medium-sized pot. 4. Place biscuits in a bag and crush with a rolling pin. 5. Add crushed biscuits to melted butter and mix well. Press the mixture onto base of baking pan. Put the crust in the fridge as the filling is prepared. 6. Place eggs and sugar in a large bowl and beat until sugar is dissolved and mixture is creamy. 7. In a separate bowl, mix together cream cheese and sour cream with a wooden spoon until there are no lumps. Do not over-mix. Stir in the lemon juice and grated lemon rind. Combine with the cheese and egg mixture. 8. Remove crust from the fridge and pour in the combined mixture. 9. Bake in oven for 40-45 min. 10. Turn off heat and allow to cool in oven with door ajar. Refrigerate for at least a few hours before serving. 11. 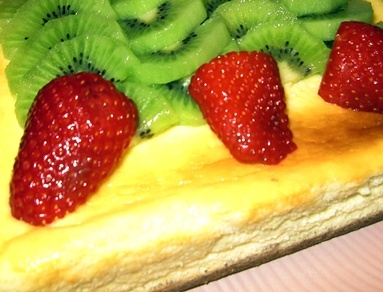 Either leave it plain or decorate the top with fruits. 1. Put sugar, water, cornflour and lemon juice in a small pot. 2. Heat, stir until thickened. 3. Add half the blueberries and continue to cook until soft. Allow to cool. 4. Arrange the remaining blueberries on top of the cake and spread the topping over. Refrigerate until ready to serve.